Tonight’s we had an onionstravaganza! 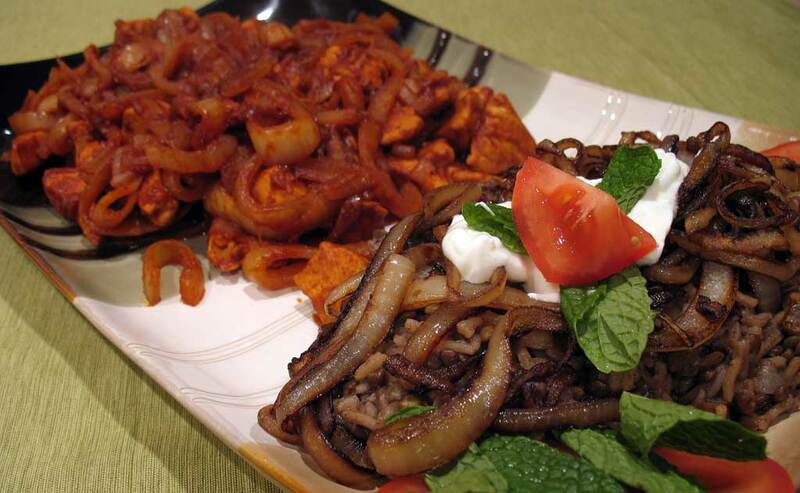 Mujadara, a Lebanese rice and lentil dish topped with blackened onions, paired with chicken cooked with onions, tomato, and hot pepper, served family-style. The chicken recipe comes from Secrets of Healthy Middle Eastern Cuisine. I could have made the chicken spicier; our red pepper’s not hot enough. Yeah it’s not super-hot. Maybe add more onions. True; doesn’t the surgeon general recommend 8 entire onions a day? We’re almost there now! So good … I love the sweet taste of the rice! I love the onion taste of the everything. Heat 2 tablespoons oil in large saucepan over medium-high heat. Add chopped onion and next 4 ingredients; sauté until onion softens, about 4 minutes. Add broth and lentils; bring to boil. Reduce heat to medium-low and simmer, covered, 10 minutes. Stir in rice; return to boil. Reduce heat to medium-low; cover and cook until liquid is absorbed and rice and lentils are tender, about 15 minutes longer. Meanwhile, heat 2 tablespoons oil in heavy large skillet over medium-high heat. Add sliced onions; sauté until soft and beginning to blacken, about 20 minutes. Season to taste with salt and pepper. Transfer to plates; top with blackened onions. Garnish with tomatoes, yogurt, and mint. Cut the chicken into 2″ pieces and coat with 1/2 tsp of the red pepper. Sautee the chicken over medium-high heat until golden brown. Remove from the pan and set aside. Add the onions to the pan with a couple tbsps of water; cook until translucent. Return the chicken to the pan, and add the tomato paste, water, and the rest of the hot red pepper. Cook over medium heat for 10 minutes.